This wonderful salad of pasta, currants, and vegetables is dressed with a tangy vinaigrette. Bring the wild rice and water to a boil in a saucepan. Reduce heat to medium-low, cover, and simmer until the rice is tender but not mushy, 20 to 45 minutes depending on the variety of wild rice. Drain off any excess liquid, fluff the rice with a fork, and cook uncovered 5 minutes more. Once finished, spread into a shallow dish, and refrigerate until cold. Bring a large pot of lightly salted water to a boil. Add the orzo pasta, and cook until al dente, 7 to 8 minute. Drain, rinse with cold water, and chill. Place the chilled rice and orzo into a large mixing bowl. 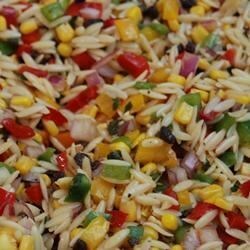 Stir in the red onion, currants, corn, yellow bell pepper, red bell pepper, and green bell pepper. Season with 2 tablespoons basil, salt, and 1/2 teaspoon pepper. In a separate bowl, whisk together the vinegar, honey, mustard, garlic, 1/8 teaspoon pepper, and 1 1/2 teaspoons basil. Slowly whisk in the canola and olive oils until emulsified. Stir the dressing into the pasta, and refrigerate 2 hours before serving.